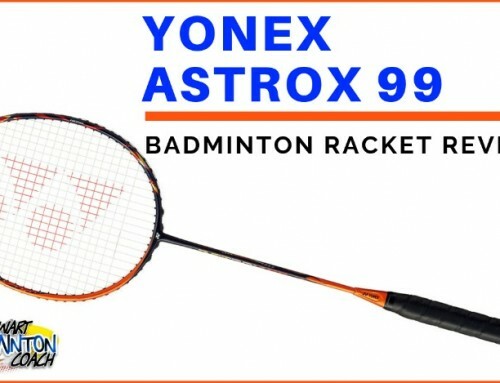 Yonex launched the first Astrox racket in 2017. In typical fashion, the first in a series has a number “7” in the name. 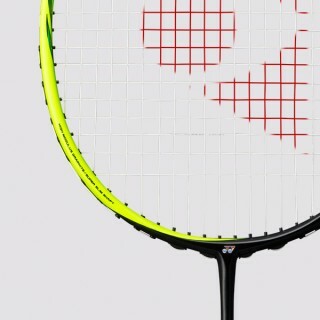 So, the Yonex Astrox 77 was born, and soon we witnessed numerous top 10 players using this racket on the world stage. 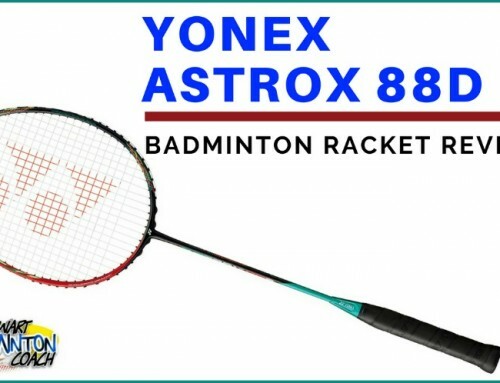 Initially, there was some confusion which Yonex range the Astrox would replace, but nowadays it is clear the head heavy Voltric range will slowly be withdrawn with Astrox taking over the “power” mantle utilising the latest advances in carbon technology. High-priced Yonex rackets are accompanied with a full length cover, with this sample a two tone black design with the brand and range names in silver; understated and classy. The black, yellow, blue and turquoise/green combination works well and presents almost a two sided racket, although this is by no means a duo frame shape like Duora range. This is a 4U version (80-84g) G4, larger grip, which is the standard grip size for Yonex rackets in Europe. The Astrox 77 racket arrived unstrung so I added Ashaway string at customary 25lbs tension. Unusually, this racket was introduced into Europe in two colourways and two weights. I only have one version to review sadly. I had to read up on the technology whilst I worked out what this racket was representing. I won’t discuss the marketing or technology behind the Astrox preferring to leave the “techy” information the geeks. This review sample is slight head heavy, medium/stiff flex, standard size head and a “boxy” frame which means there are no additional aerodynamic qualities. 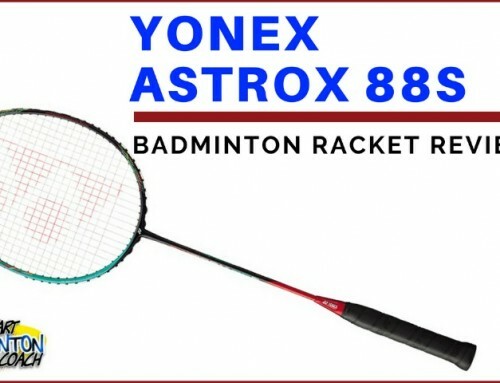 Yonex have had a lot of success with their head heavy ranges over the last few years through Arcsaber and then Voltric, so the Astrox has a lot to live up to. Mentally, I’m comparing this to Voltric 70 or Voltric 80 so it has to perform incredibly well to win over fans of these particular rackets. I’ve tested a few 4U weighted, head heavy rackets over the years and most have proved to be excellent rackets and sold very well. 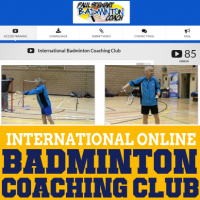 A new Yonex racket generally sells well without proving itself in the market, due to clever marketing and player endorsement, so I this racket, on paper, should perform well. 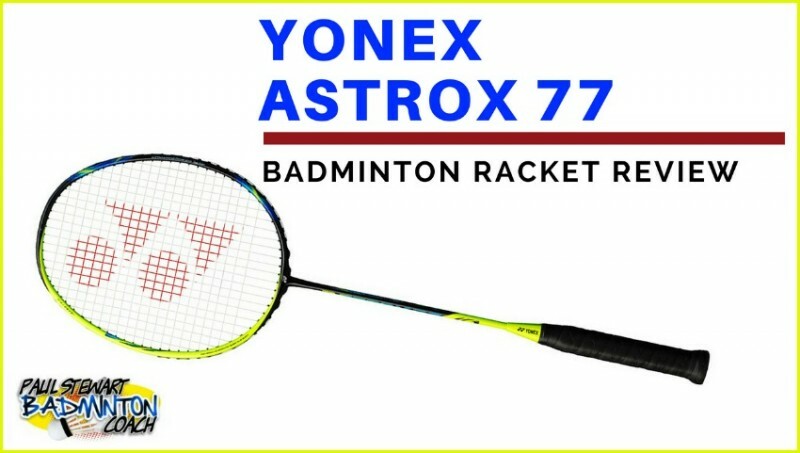 Astrox 77 has a unique feel and differs from other Yonex rackets I’ve tested. There’s an almost hollow feel to this frame which is unusual. This coupled with the lighter frame dampened my excitement when hitting overhead clears. The results were OK but not as I would expect from a racket of this calibre. 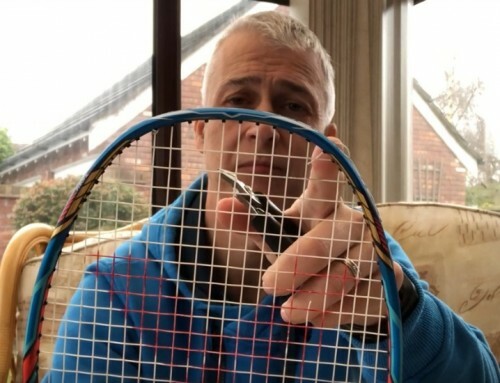 I can’t quite understand the reason why, but this racket is lacking in power and feedback off the shot. It could be it works better with a different string and tension combination. Drop shots were crisp and the lighter frame gave them a snappy feel. Whilst I could play a good range of shots, I never felt as though I really had command of the racket, lacking feel most of the time. The hollowness of the frame didn’t help although the shots I hit were of a good standard. Maybe this is one of those rackets that needs more time to settle in? Onto the smash. Again, the frame moves well but is lacking power. I should be able to generate good racket head speed and it simply wasn’t coming through sufficiently. The head isn’t too heavy to fatigue the arm, but the entire racket felt like it needed beefing up a little. Flat drives were quick and again, there is no sign of fatigue. The racket continues to move well and deliver crisp drives, although needed a lot more work to achieve a decent result. Defensively, the Yonex Astrox 77 performed pretty well. It was fast and this is due to the slightly lighter weight, but it struggled to give me the feel I require, although it still delivered the solid control I expect from a head heavy racket. A little more punch in the fast returns would be welcome. Around the net Astrox 77 is quick and perhaps this is where it shines best. The lighter frame allows for greater response from a player combined with enough head weight to feel where the racket is moving. Interceptions and fast hitting were good and did not bring on fatigue in the arm which is always a welcome bonus. The light touch for net shots was always good. Since being a teenager, I’ve always been excited to try any new Yonex racket. Despite the numerous high-profile players using this racket, and the supposed new technology, it fails to shine as a great racket should. It’s the first to be launched in the range and my guess is the next model up from this will be so much better. This is usually the way with most new range launches, irrespective of brand. I wanted better feedback from this racket. It felt a touch hollow and lacking in power to excite me, but it does have one or two tricks up its sleeve. I still believe Yonex miss out by sticking to the standard grip size that’s been around for years. I’m told that the thinking here is that European players have bigger hands. However, if Viktor Axelson, current World Champion, who stands 6ft 4 inches, uses a G5 grip, with his towel grip wrapped directly onto the wooden handle, shouldn’t this be telling us something? RRP is an chunky £175. Retailers will offer this racket at a discount and you should expect to pay around £140. Overall, in this current market, this is becoming a standard price for top end rackets. 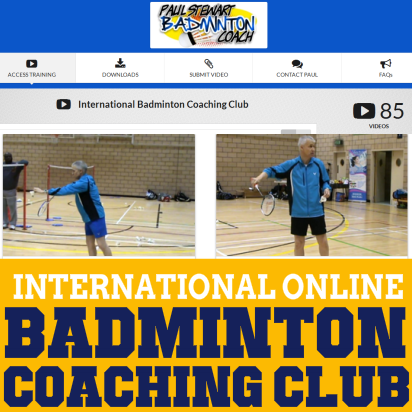 Yonex frames are always popular, and Yonex cannot afford to sit back with current competition. Whilst this initial entry into the range is a fairly good racket, there is no stand out feature in the new technology to make me rave, which is a shame. Let’s hope there are greater things in store for the Astrox range in the future. Sadly the Yonex Astrox 77 was a shade disappointing and therefore I award this racket 4 stars. 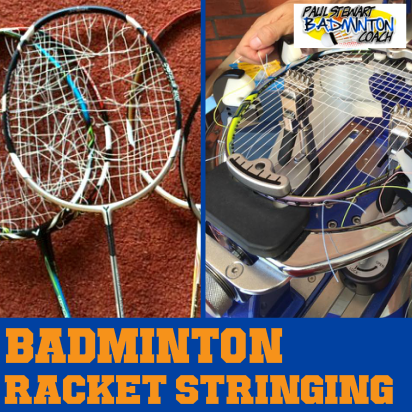 Hi paul give me suggestion about some bandminton racket which is best for playing nylon shuttlecock. I prefer allround type doubles badminton racket. I am an intermediate offensive backcourt player in doubles and fond of playing smash and drop shots. Thanks. there is no such thing as the best racket in the world or the best for playing with nylon shuttles. 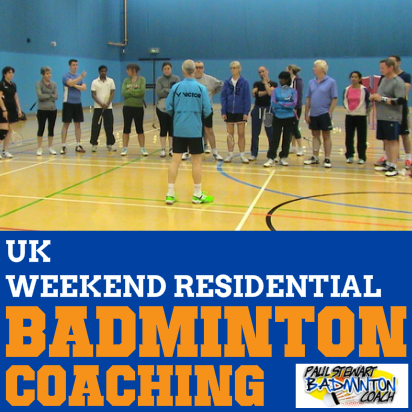 You choose a racket and ensure the string tension isn’t too high. Please recommend some racket name which will be better you think according to my playing style. Please paul. Coz in my situation i have no chance to testify different racket easily. I am curently using astrox 77 and i am thinking about buying a voltric 80 e-tune or voltric 80. VT80 is cheaper and u gave it 5 star rating but to VT80ET u gave 4 star rating and u were disapponted. What do you u think i should rather buy? I know about Astrox 77 – not too good but just OK.
YOu could text Jetspeed 12 M, Jetspeed 11 or Thruster F from Victor. All are very good rackets. Hypernano 990 could also work. We also tested it and found that it is fast racket but from 3rd line it is bit sluggish in nature. Moreover , i think it is overpriced. Yonex cann put some extra weight on frame to make it better for power shots…. I agree with your findings. I was a little disappointed and expected more from Astrox 77. I had a similar experience, Paul. However after switching to the ASTROX 88D 4U, for me its the perfect racket apart from the G4 grip which UK only do. So I bought a second one from Australia who also stock the G5 grip. And now for my style of play with the strings I use (BG80 Power 24lb) which have not changed for over 6 years now, it’s near perfect as can be. Hope you get a chance to review the 88D and 88S, these are very different to the 77. 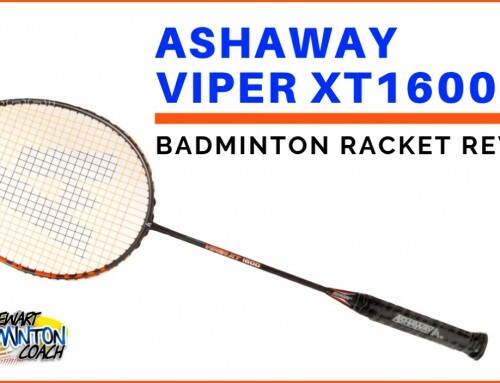 Although my badminton partner who I sold this to swears is the best racket he has owned in a long while and does not like the 88D or 88S:). I am currently testing both Astrox 88’s and will post a few shortly. I also agree that it’s disappointing that Yonex do not consider introducing smaller grips. Most of the players select G5 grips, even Axelson at 6ft 4 uses a G5 grip.